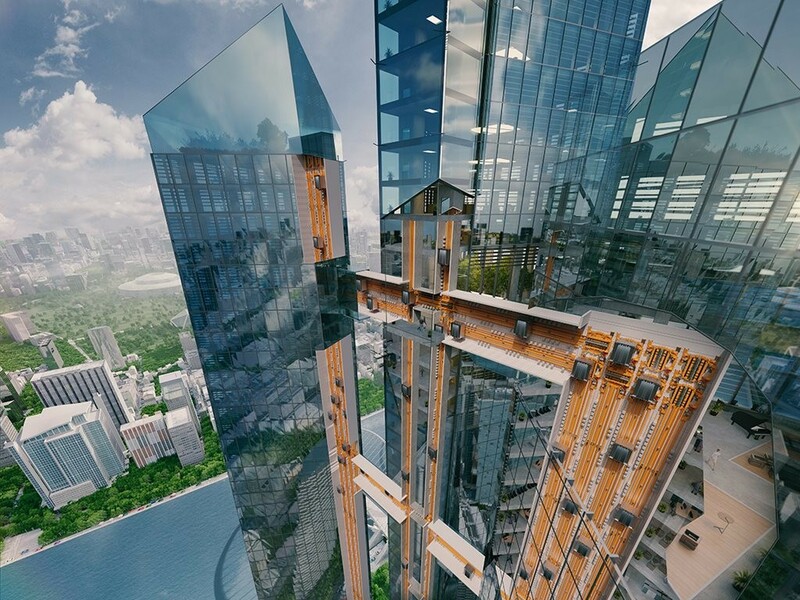 German engineering company thyssenkrupp has redesigned the traditional lift by inventing a horizontal elevator that dispenses with the old no steel ropes and replaces them with electric motors. Known as the ‘Multi’, the technology uses a range of linear electric motors and guiding equipment, much like what is used in monorail and magnetic train technology which enables the lift to make 90 degree turns. With the Multi system, multiple cabins can also travel safely up one shaft and down another in a single continuous loop, much like a circular train system on a vertical plane. The doors also open more often - every 15 to 30 seconds, despite having fewer shafts than standard elevator systems. Not only quicker and more efficient for the movement of people, with its lighter cabins, the Multi system allows multiple lift cabins to be used on fewer shafts at any given time, while eliminating the ropes and counterweights of conventional elevators decreases the overall mass of the elevator system. All this adds up to lowering the elevators environmental footprint by up to 50 percent, according to thyssenkrupp. The company also notes other advantages of the new system includes the elevator being able to be set up in a shuttle system thereby allowing greater capacity, optimising people movement and even enabling the possibility of the addition of a double entrance lobby to a new building design. Added to that, says the company, with its multi-propulsion braking and control system, the safety of passengers is assured. “It will reduce waiting times for passengers and take up significantly less space within the building. Multi is a key offering that truly represents a landmark revolution in the elevator industry,” he says. As the world’s urbanised population continues to grow and age - with predictions of a 2.5 billion increase in urban dwellers by 2050 - vertical developments will become more common, making this development both welcome and ultimately, much more useful to both builders and users alike. For architects and designers, this means that a range of options, once thought impossible are now available, especially when dealing with constraints around design limits due to elevator shaft heights and issues concerning vertical alignments.